The internet brings miracles! So cool to hear of you and this great work you are doing. At the time, my company, Cactus Productions, Inc. of Las Vegas was partnered with Marc Corwin and Multi Media Concepts. 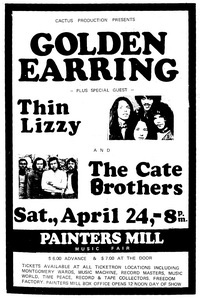 The show was at the 2,500 seat in-the-round Painters Mill Music Fair in Baltimore County, Maryland in an area called Owings Mills. This venue is no longer there. Tickets were $6.00 in advance, $7.00 at the door. Don't think we sold out but probably around 1,800-2,000 attended. I was in the front row with a bottle of Jack Daniels and remember how powerful the band was. It WAS a magical show. Met the boys backstage and I remember getting a call from the hotel, something about somebody throwing a TV out the hotel room window, but not sure which band that was. I remember wearing a plaid suit. we dressed up back then. I lived just a couple miles away from the venue and put on about 6 concerts there. Jailbreak was getting airplay on local FM station. I thought the band was professional the way they handled themselves and being a young guy still learning the business, realized the historic nature of what I was experiencing. we really rocked that night! 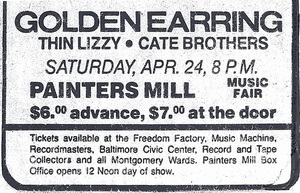 Sorry, I have no ticket from that event, but attached here, see the black and white handbill and a small print ad that appeared in the Baltimore Sun for about 5 weeks. The entire event budget was about $12-14,000. back then.